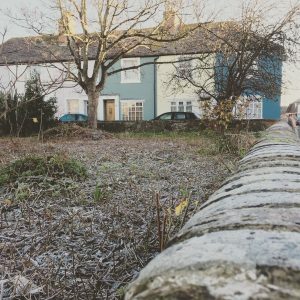 As frosty mornings become a frequent sight and as another busy year ends, Ashley Tanton reflects on our progress in 2016 and looks forward to the coming year. This time a year ago, the end of our fundraising efforts was drawing closer and our efforts had seen us surpass the 80% marker. In the months that followed, we surpassed our total and our appeal fund stood at £28,000. As our solicitors began the work to transfer the land, behind the scenes, Andy and I had started to piece together an application for lottery funding. We made contact with the lottery and submitted a project enquiry to them. The biggest cost associated with the creation of the community garden will be repairing the boundary wall. The recent works to clear the undergrowth inside the Triangle has enabled us to obtain a better understanding of the condition inside of the boundary walls and it’s not looking good. Much of the wall inside has been invaded by ivy, brambles and ground elder. The result is a structure that is fragile and likely to collapse with any level of intervention. The options available to us are being explored but it seems likely that sections of the wall will need to be taken down entirely and re-built. Working with the previous owners before the sale was completed, we consulted with SDC on taking down a section of the wall on Windmill Street before it collapsed. The fragility on that section is as a result of a tree seeded close to the wall. This presence of roots and stumps in close proximity to the wall is repeated in several other locations across the site. In those locations, the wall may need to be taken down temporarily to enable the tree roots and stumps to be completely removed. The result of the enquiry to the lottery was that they would be keen for us to provide opportunities for volunteers to engage with the heritage of the site and become involved in the works to restore the walls. We support the concept of wall workshops where an expert would pass on skills to volunteers and we will explore how we enable this before finalising our grant application. Another challenge for us going forward is the level of the ground within the Triangle: in places the level is perhaps at least a foot higher than the surrounding paths and roads. At some point previously, the land was cleared and shingle laid out on a cloth membrane. The presence of the membrane might restrict our freedom to landscape the site and we may well need to remove it entirely – that’s about 43 cubic metres of material to be disposed of. The charity that owns the Triangle was formed by Andy Maguire, Jill Stewart and me in August 2015. In 2016, Jill stood down and Jim Twist joined us. The resulting three trustees have a legal responsibility for the running of the charity. At some point in the project we will seek to increase the number of trustees to share that responsibility with a wider section of the community. So what next? Immediately, you will not notice much happening on site but rest assured that in the background, we will be working hard to finalise an application for lottery funding that will, if awarded, enable the project to proceed further. We are still interested in receiving ideas for landscaping and general planting with the emphasis on native plants and the promotion of wildlife so do please get in touch. The work of the trustees, donors, volunteers and supporters generally have paved the way in 2016 to the creation of a wonderful community space and I personally am so proud of everything we have achieved. I look forward to 2017 and am excited to see what a difference we can in the new year.